The new features - Please note all the below must be carried out within the 1st minute of powering up the unit. DARK MODE - To stop the system's LED flashing green when the unit is powered up, hold down the mute button for 10 flashes of the green LED and release. The LED will then flash Green/Red with a series of bleeps. This will have activated DARK MODE, which means the LED will flash upon start-up, but will then only illuminate in an alert state. You can now choose how far away from an object you wish to be alerted when parking. Press and hold the mute button for 3 flashes of the Green LED and release. The unit will flash Green/Red with a series of bleeps. As you know, the LPP has a 5 second time-out when it sees another laser signal which could result in interference. We have heard from some customers that they value the ability to park above that of not causing unnecessary interference. Therefore the 5 second time-out can now be deactivated so that your LPP will always stay active. To activate this setting, hold down the Mute button for 21 flashes of the LED. The unit will flash Green/Red with a series of bleeps. Press and hold the mute button for 5 flashes of the Green LED and release. Unit will flash Green/Red with a series of bleeps. Laser Pro was developed to meet the needs of a demanding ever changing market and is part of a range of products that are both innovative and updateable, allowing you and your vehicles protection to evolve and meet the ever changing threats in society. The Laser Pro team have many years experience and the Laser Pro is designed & built in Europe using only ROHS compliant components, using the highest quality lasers and receivers. Not all laser products are the same. The research and development is on-going and we have exciting new lines being tested extensively and hope to bring them to you in the near future. The system designed to assist the driver when parking a vehicle and prevent unnecessary damage to the bodywork, as well as warning of approaching hazards the unit can be used to activate other Laser Pro products such as our home security light system. We believe the Laser Pro Park will increase your driving pleasure and keep you and your vehicle safe from unnecessary damage for many years to come. The brighter the surface the further the distance the Laser Pro Park will detect - up to 3 metres away. Parking in ones own garage for example we recommend you test with different materials in front of the vehicle. 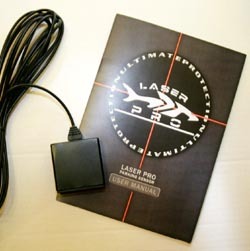 The harness for the Laser Pro has the switch, buzzer and LED included to give you control and warnings of impending danger or interference from other laser systems. In order to avoid interference with other laser based systems the Laser Pro Park has been designed to alert the driver of possible interference & if necessary switch the system down. .
Arguably the most important part of the kit the sensor head does all the hard work. The Laser Pro is the only device on the market to use such high quality lasers and lenses giving huge advantages to both reception and coverage. The unit is supplied with a single laser sensor which can be fitted to either the front or the rear of the vehicle, additional laser sensor heads are available which plug in to the same junction box. The unit uses the licence free 904nm laser frequency. The same frequency as used by several motor manufacturers eg. Nissan's adaptive cruise control system which uses laser to determine the distance immediately in front of the vehicle and to deactivate the cruise control if the stopping distance is considered to be too short. Police laser guns use the same 904 nm frequency also.